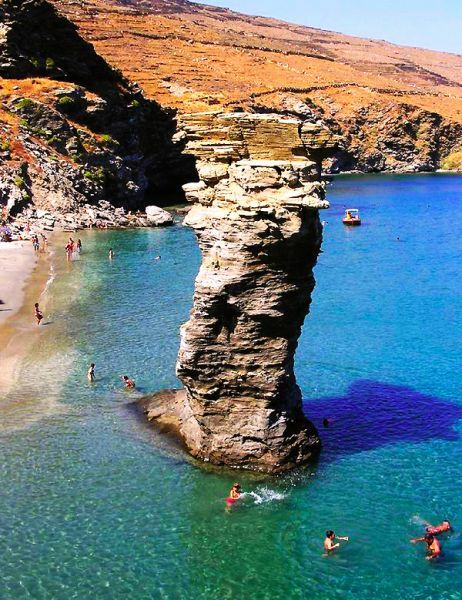 Andros is the second largest island of the Cyclades (Kyklades) complex and it is found at its northern edge. 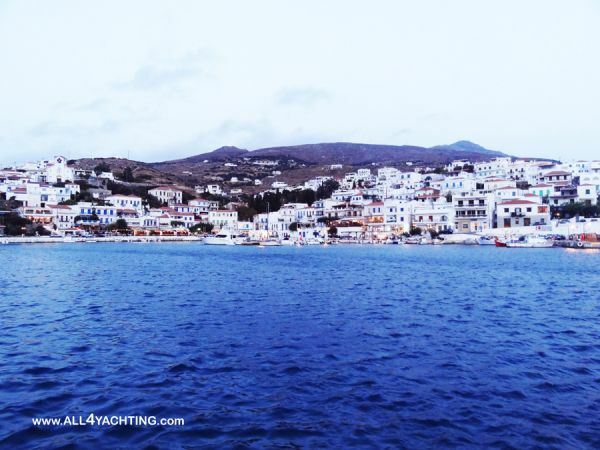 It is an island that reflects an aristocratic flair and culture. This was probably enhanced by the world famous shipowners and their families, who were born there and tried to retain the islands’ culture and identity. 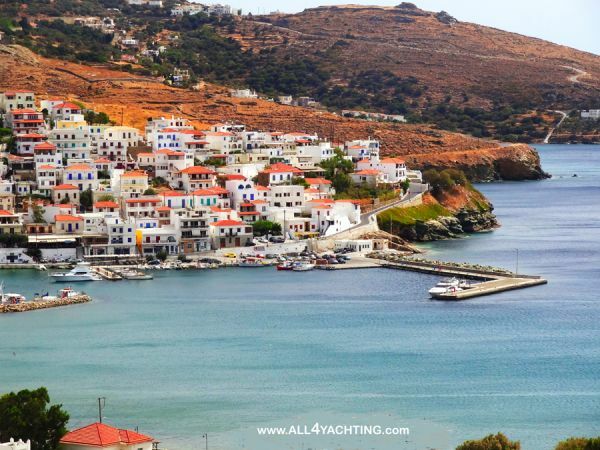 Andros is quite different compared to the most of the Cycladian islands due to its relatively rich vegetation, its natural waters sources and its architecture, which is characterized by red roofed white houses. Those who want to have the real picture of the island, have to rent a car because distances are quite long and the things worth seeing are many. 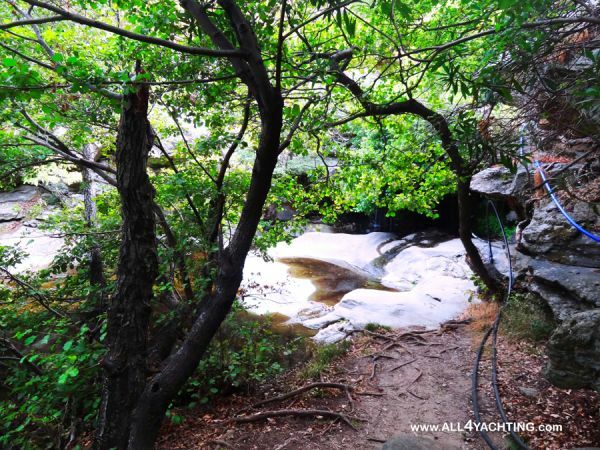 Additionally, one of the most interesting parts of the island is found in its mainland. 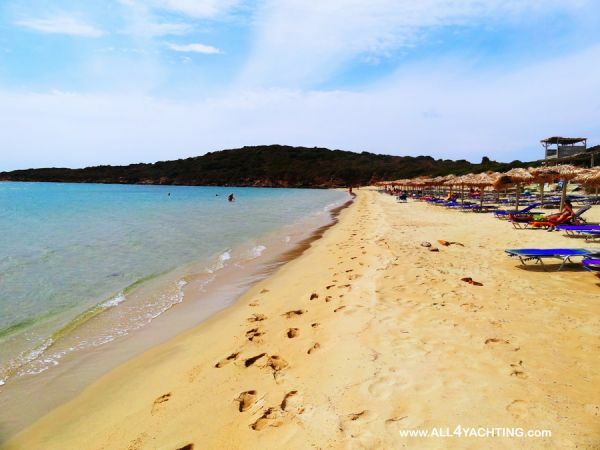 - The 60+ amazing beaches, with crystalline blue-green waters and soft golden sand. 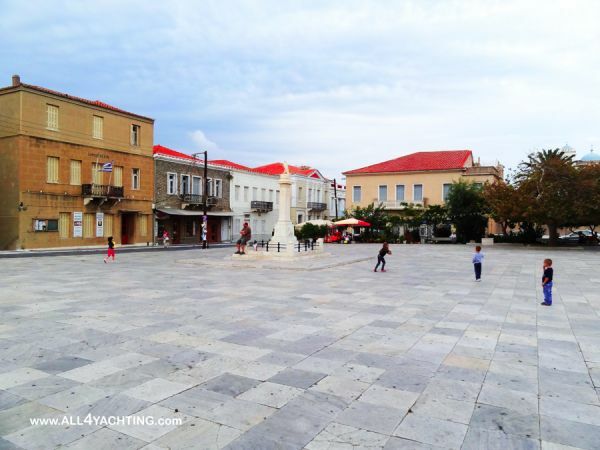 - The unique “Hora”, the beautiful capital, with the impressive squares and the neoclassical houses, built on a narrow peninsula offering sea views. The interesting trekking routes, passing through little lakes, rivers, waterfalls, traditional villages and ending to attractive beaches. 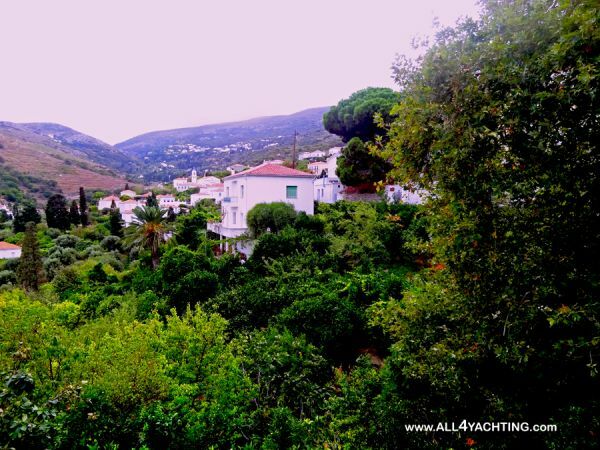 - The inner land with the lush vegetation and the beautiful traditional villages. 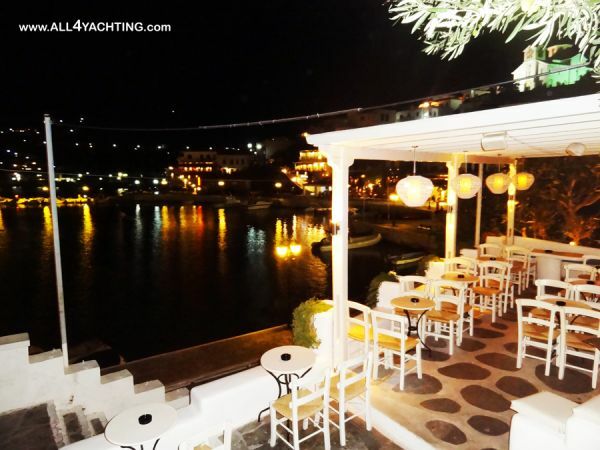 - The picturesque fishing village of Batsi, which has been developed to the most touristic spot of the island, with attractive bars and good tavernas by the sea. 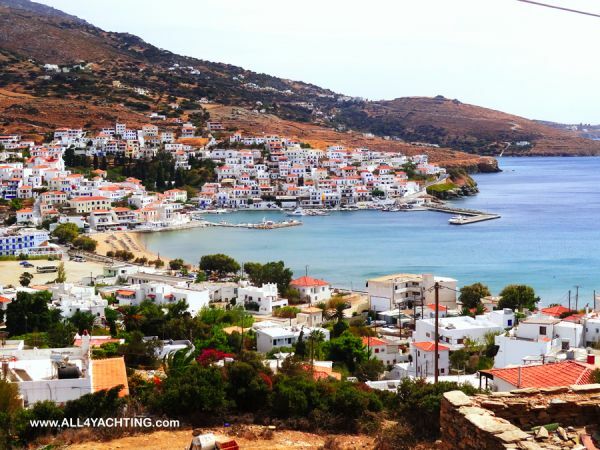 - The coastal town of Korthi and the nearby villages. restaurants found in the island. 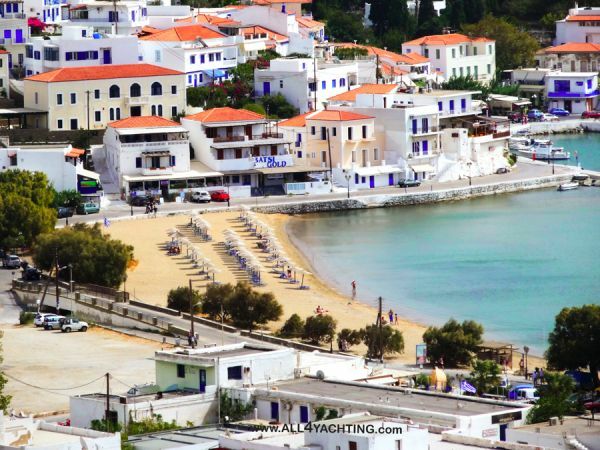 Gavrio, the main port, is the safest one in Andros. However, it has gusts with N-NE winds and wash from the ferries. 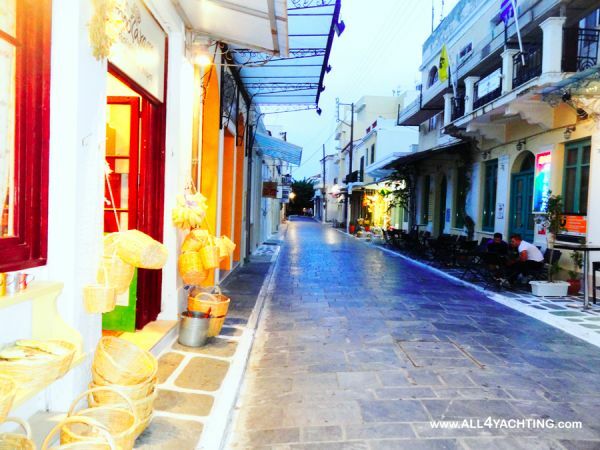 You will find some cafes and tavernas but it is not considered as the most attractive part of the island. With North-NE winds it is better to moor in Batsi. The quay has several places for private yachts and electricity supply. You should take into consideration however, that Batsi also has gusts and it is open to S-SW which may become dangerous. Weather permitted, you may drop an anchor in the bay. 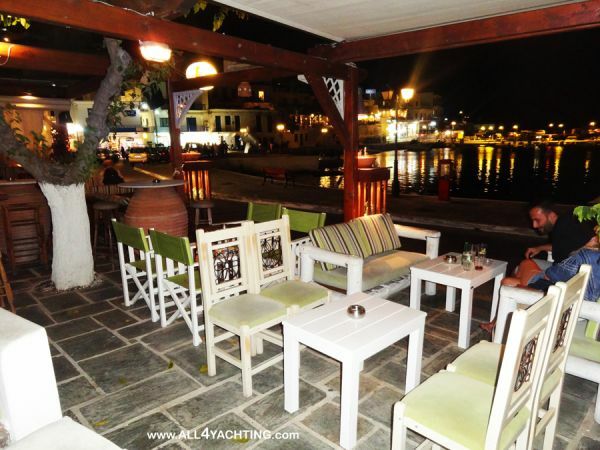 Batsi is a charming tourist resort with nice bars, cafes, restaurants and hotels. You will also find mini markets, car rentals and other facilities. It has a beautiful sunset and a nice sandy beach. 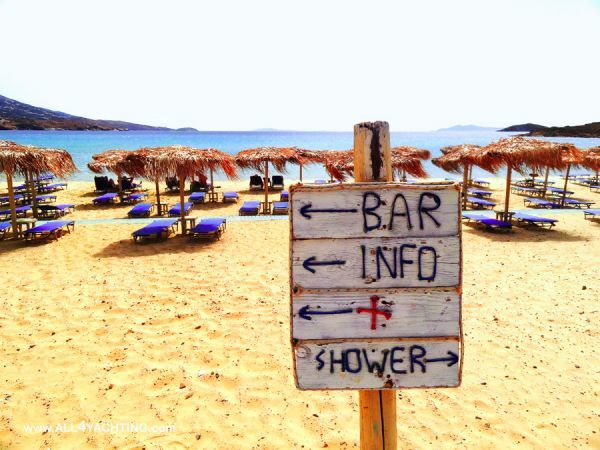 Close to Batsi you will also find many excellent sandy beaches with crystalline blue-green waters, such as Hrysi (or Psili) Ammos, Agios Petros, Kypri etc. 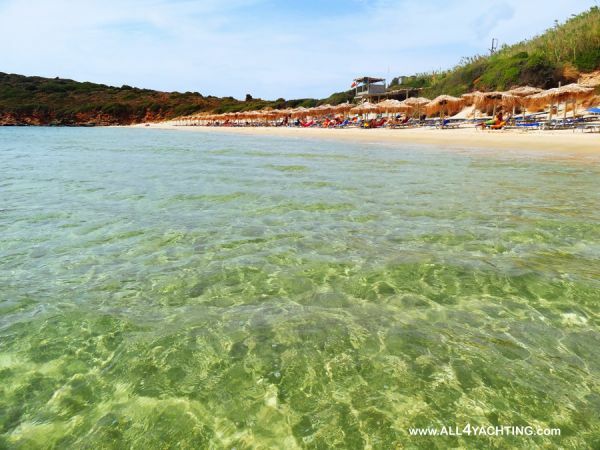 Very good beaches are also found northern of Gavrio. Among the best are: Pyrgos (with NW-E), Pisolimnionas (with N-E), Fellos (offers good protection -except with SW- and food). 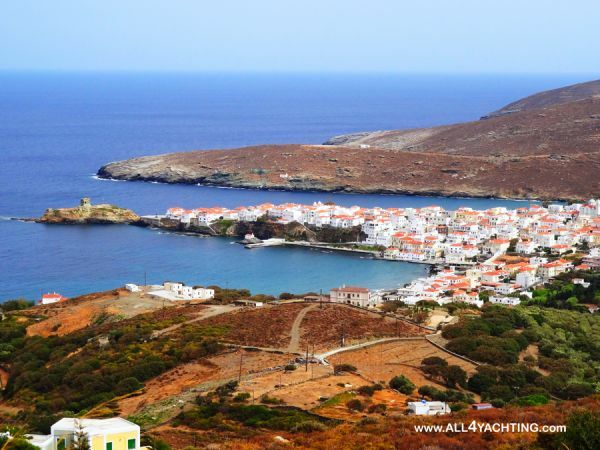 The disadvantage of mooring in the Western coast of Andros is that it is quite far (apx 50’ by car) from Hora, the Capital Town of Andros, which is the most interesting settlement of the island. However, the island offers adequate protection from N-NE winds. 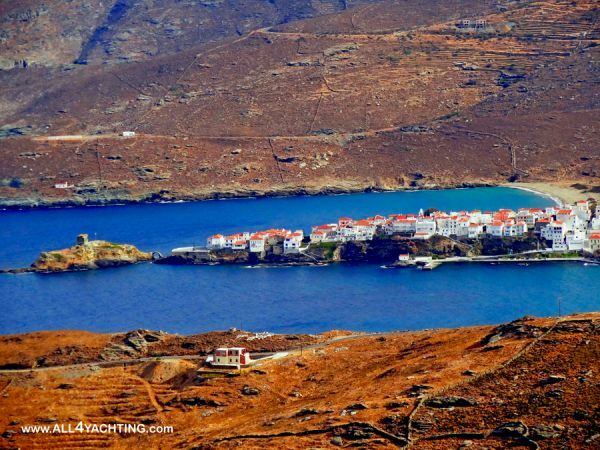 South of Batsi you will find some more charming coves and the large bay of Paleopoli, which was the ancient capital of Andros. An archaeological site and a small archaeological museum are found in the so named settlement on the hill, where you may see exhibits of the ancient Paleopolis. 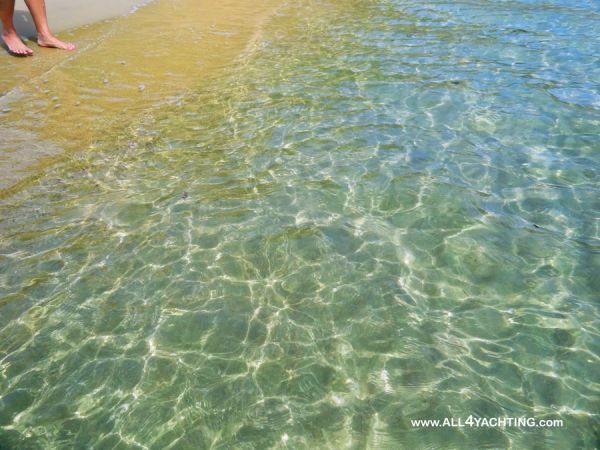 This anchorage offers some protection from the meltemi and has crystal clear waters. 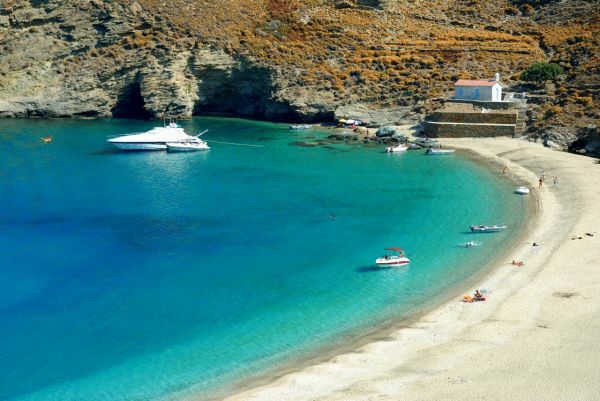 It has a beach, where you may see the remnants of the ancient port. However this beach is not as attractive as the numerous excellent beaches of the island. This is the ending place of a waterfall which is found on the mountain. 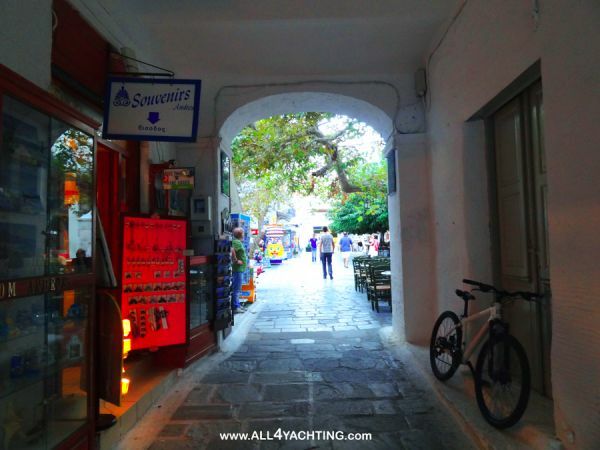 Plaka, a bit S, is another anchorage offering quite good protection from the meltemi. 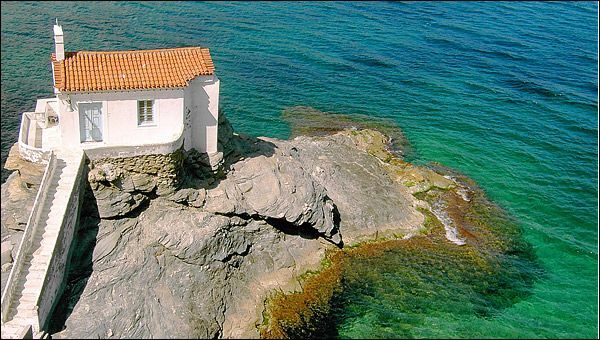 It has a beach with crystal clear sea and only a couple of stone houses. 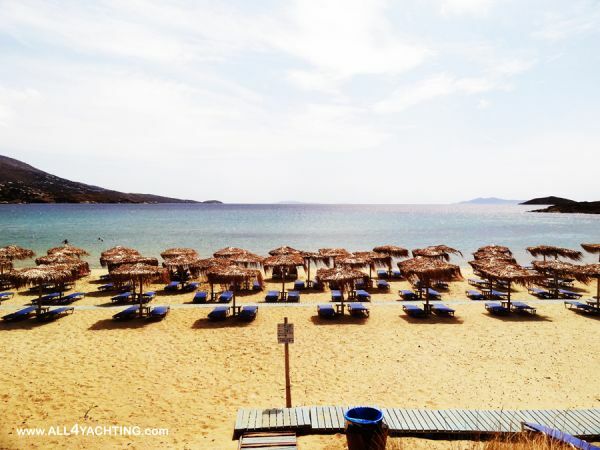 North of Plaka you will meet more nice beaches, such Ammoudara and Zagora. 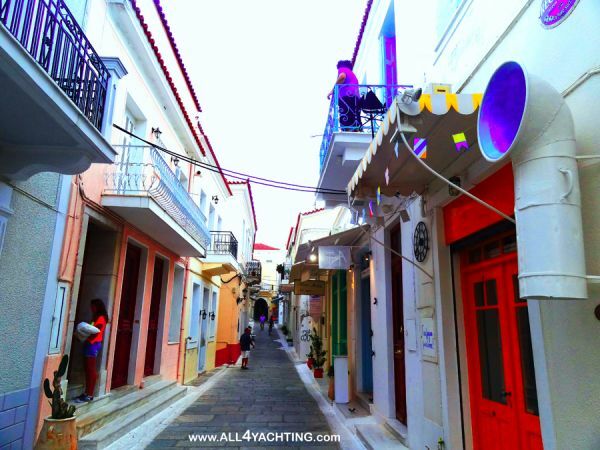 The port of Hora (the capital Town) is named Kastro and is open to the meltemi and the Easteries. The anchor does not always hold well and there are some reefs in the entrance. Therefore, unless the weather is good, it may not be a very convenient anchorage. The internal port is totally safe and protected however it is small and in most of the places there is no adequate depth. Additionally, this part of the port is usually occupied. 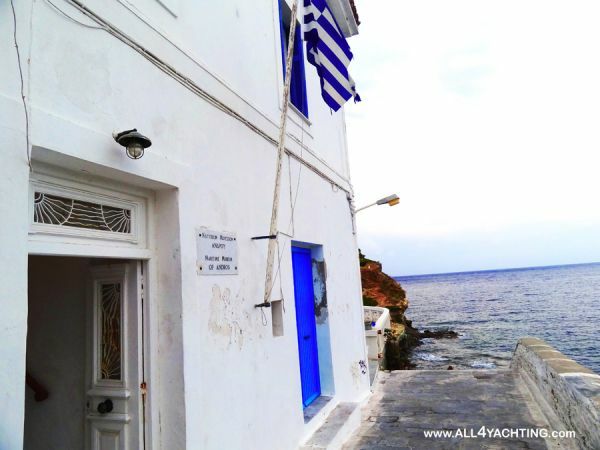 If you find a place in the external quay, which is suitable for large yachts, you should be careful with the strong North-East and East winds, which bring much swell. The port is quite close to the Town however you will need a vehicle to visit it, unless you like walking. 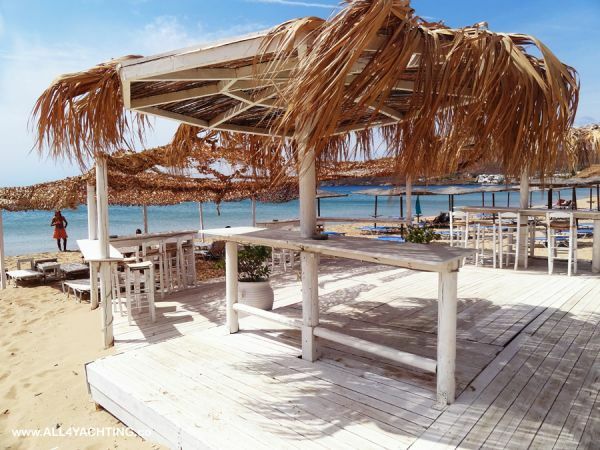 Its location is not very attractive but it is close to a nice sandy beach, called Niborio, with umbrellas and a few cafes. 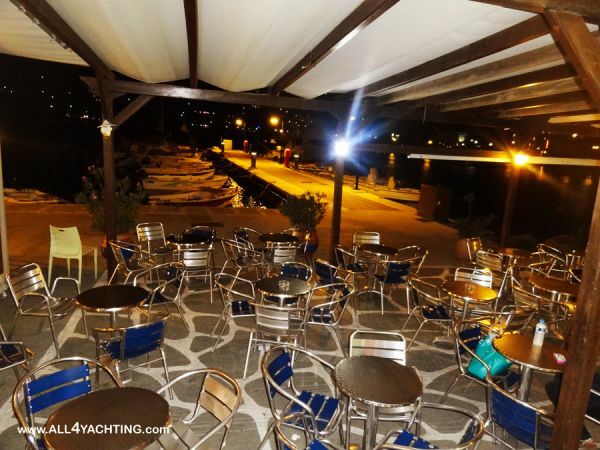 Close to the port there is also the Nautical Club of Andros, with a nice restaurant. 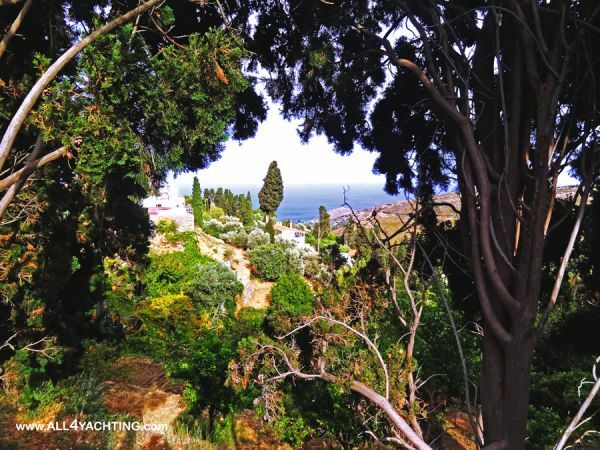 North of Kastro, you will see the charming (and quite protected from the meltemi) bays of Gialia and Piso Gialia with crystalline turquoise waters. They are found in front of the so named picturesque settlements and they offer lush vegetation and few places to eat. 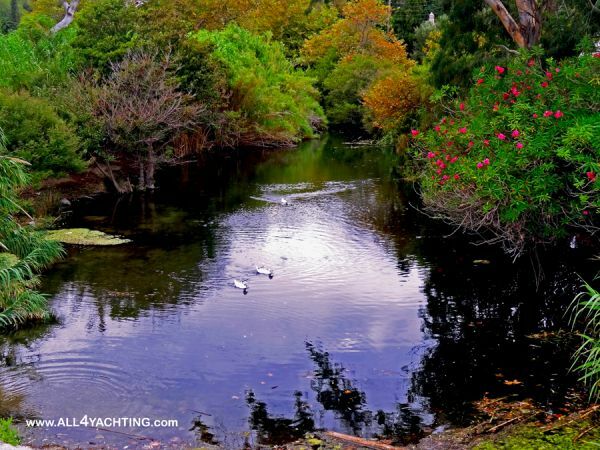 In Gialia, you also find a little lake with ducks, which is the ending point of a small river coming from the hill. Above the hills, there are the beautiful traditional villages Stenies and Sariza. 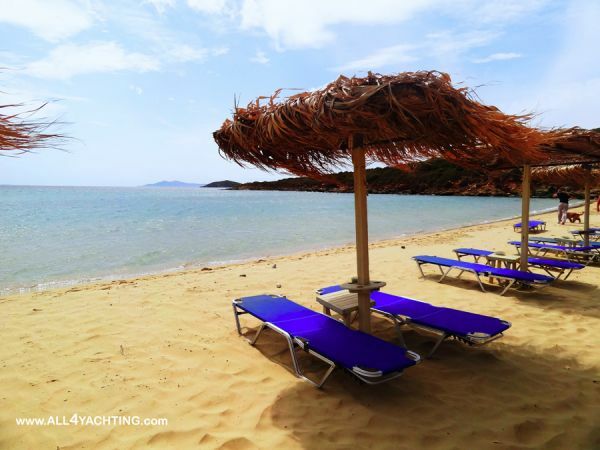 Next to Hora, on the South, there is the nice large sandy beach of Paraporti, which is open to the meltemi. 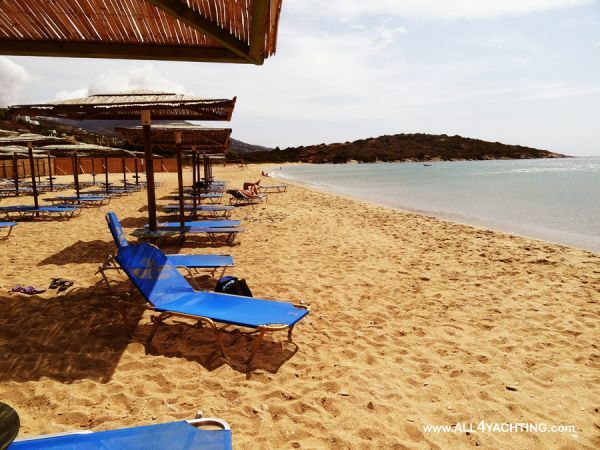 A bit further, you will find the beautiful large bay of Sineti, which is open to NE. 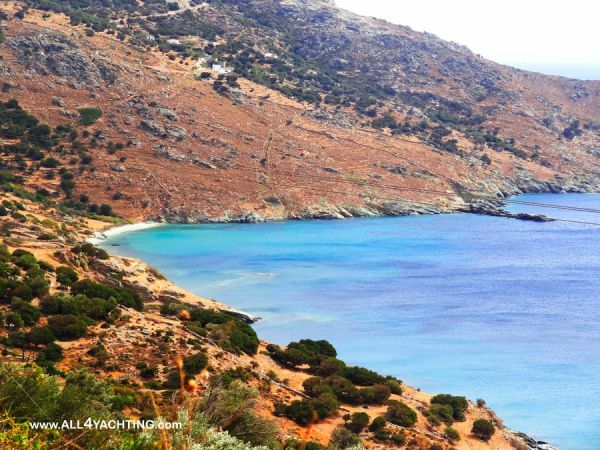 The large bay of Korthi is protected by SE-NW but has strong gusts with Northeries. On the quay you will be quite protected with most of the weathers, except the SSW. 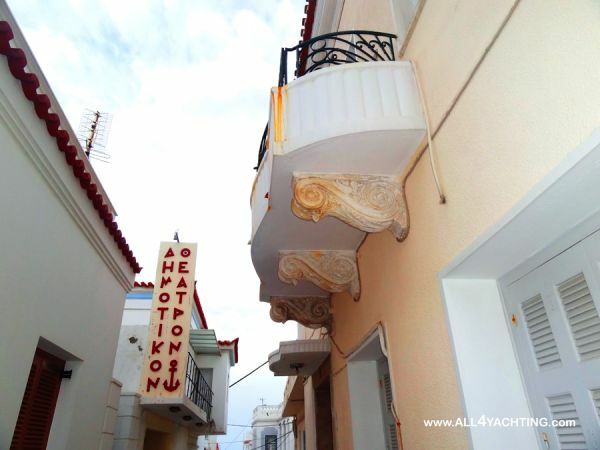 In Korthi you will find a nice beach and the small so named town, which will offer you the main facilities such as super market. 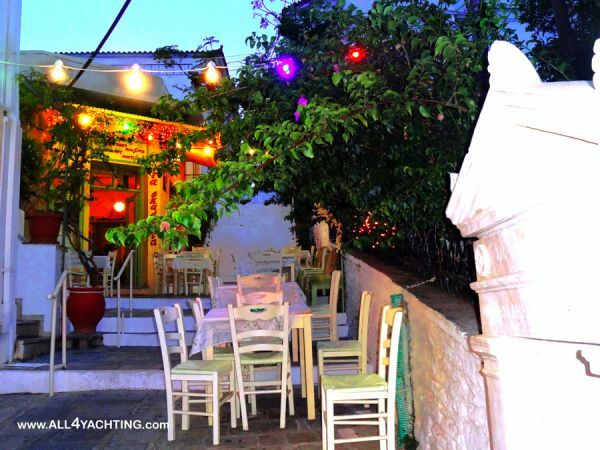 There you will also find nice coastal tavernas with good food, cafes, shops with local delicacies. 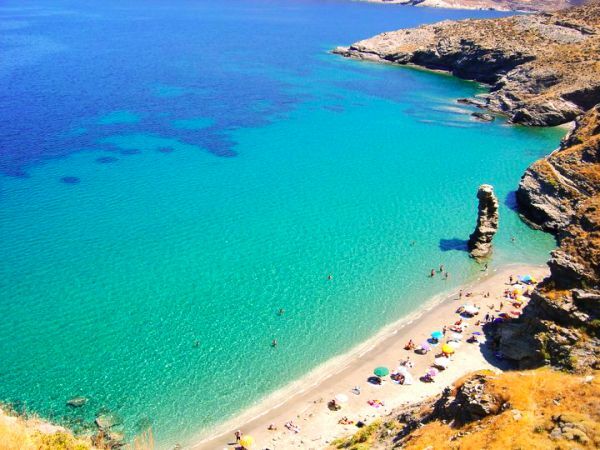 North of Korthi, you will meet the famous beach To Pidima tis Grias (The Jump of the Old Lady) with crystalline blue-green waters, soft sand and the characteristic tall rock emerging from the sea. A bit northern you will find sea caves with turquoise waters and the beautiful isolated beach of Agios Ioannis (Kremydes). 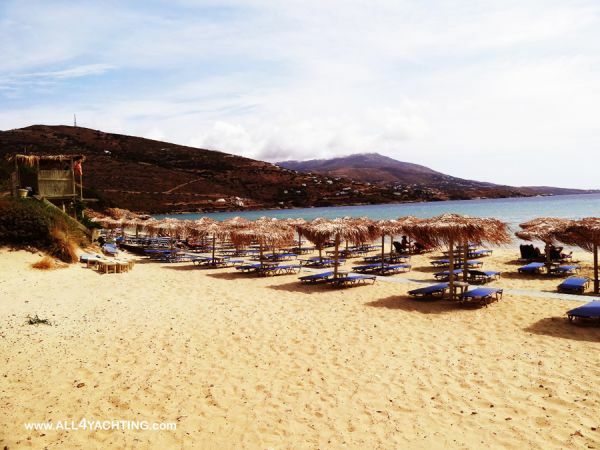 On the Northeastern coasts, you will meet some of the most beautiful and most isolated beaches of Andros. 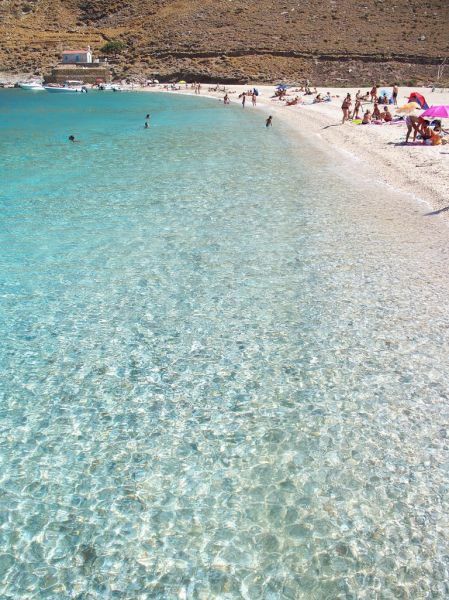 They have difficult access by car and therefore they are unspoiled with amazing transparent blue-green waters. 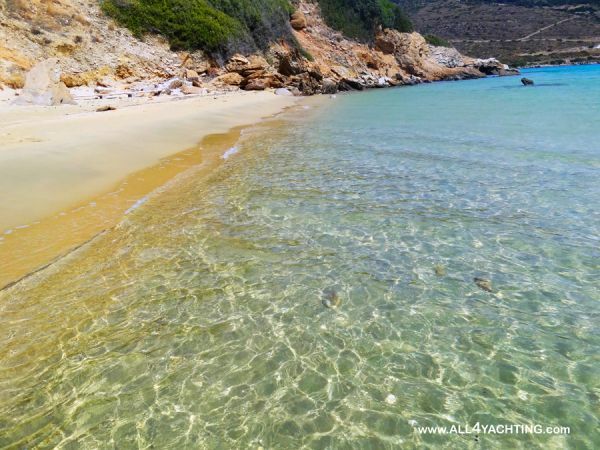 Most of them are found in protected coves and -weather permitting- you will be able drop an anchor to enjoy one of the most exquisite swimming experiences. 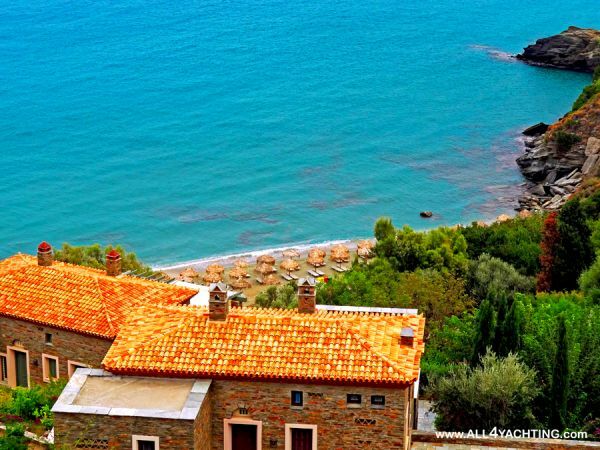 The most famous among them is Ahla beach, with the tiny chapel and the charming valley created by a little river ending to the sea. There is only a small boutique hotel, totally harmonized with the landscape, offering a small restaurant. You will be able to anchor in Ahla with SW-NE winds. 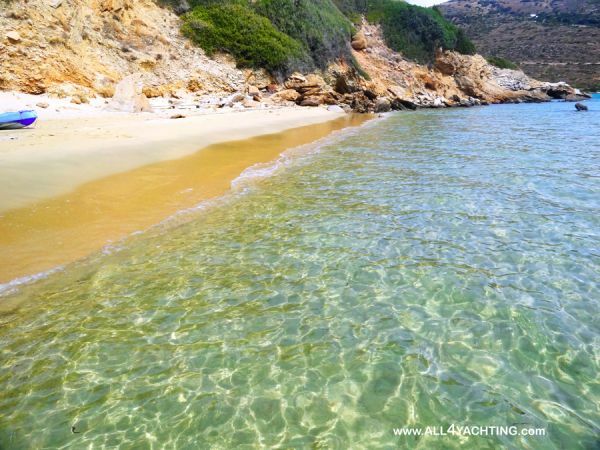 Another excellent beach is found in the cove named Vori, but is protected only by SE-NW. 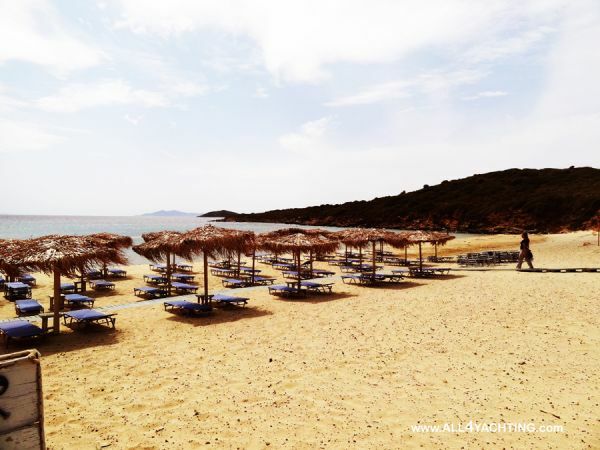 The beaches of Lefka, Ateni, Zorko are also great and protected more or less with the same winds. 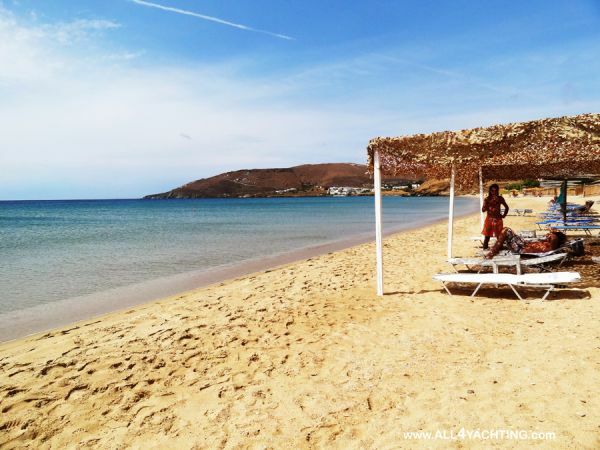 The beach of Vitali is beautiful too, but is open to N-S.
Andros has more than 60 beaches and almost all of them are amazing. For more details see the previous section and click here. 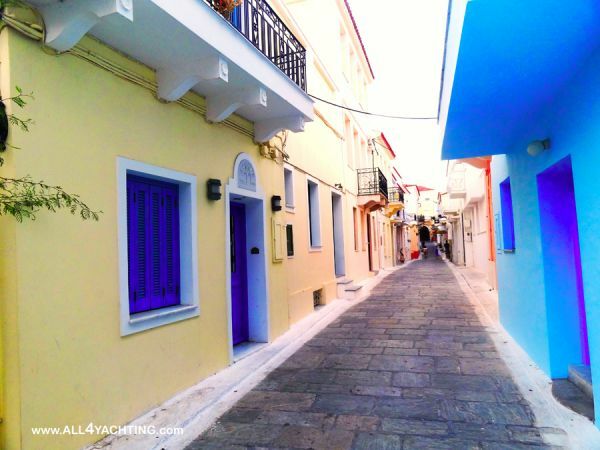 The Capital of Andros, Hora, is one of the most interesting in Greece and you should definitely not miss it. It is built on a narrow peninsula offering great views. 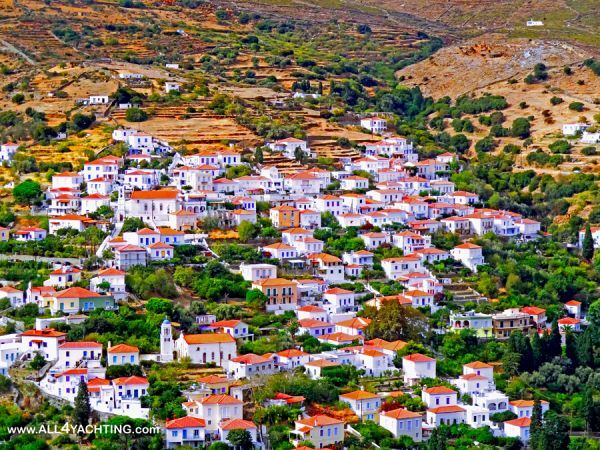 It is a traditional settlement, differentiating from most Cycladian Hora’s due to its red tiled roofs, its impressive neoclassical mansions and its beautiful squares. 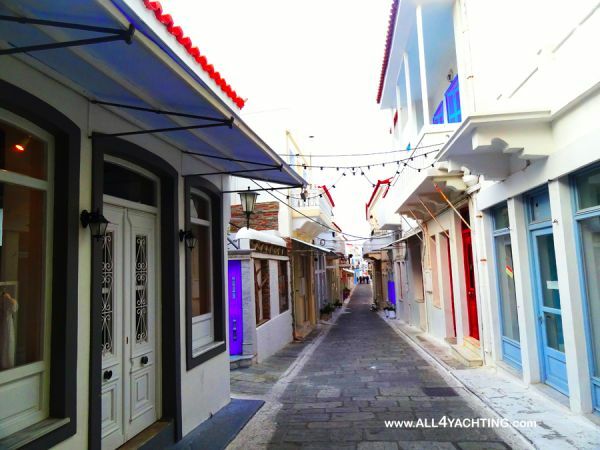 Being the home town of wealthy shipowners’ families it has a unique aristocratic flair combined with the Cycladian charms. 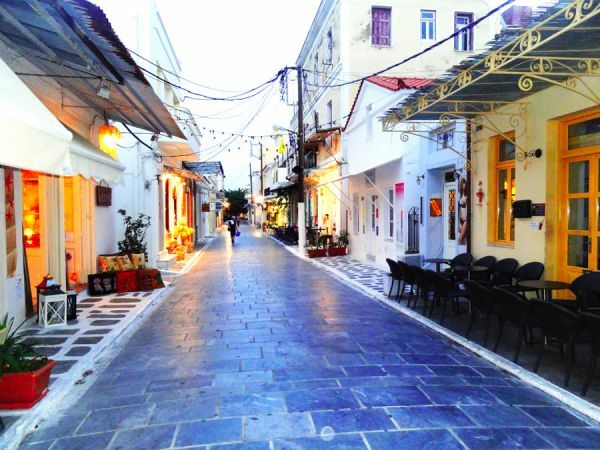 Cars are not allowed in Hora so strolling in its picturesque stone paved streets, will be an unforgettable experience. 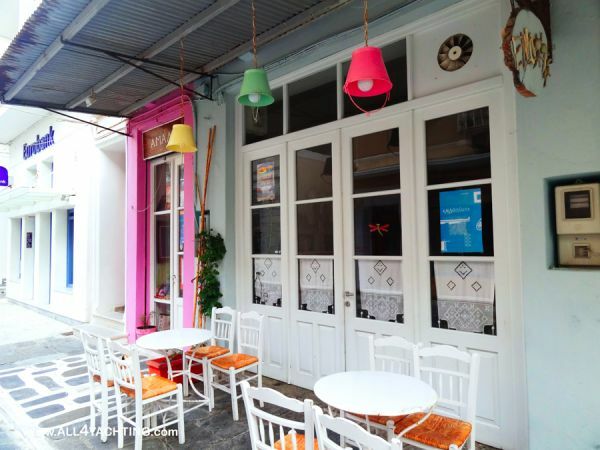 You enjoy beautiful buildings, charming cafes and restaurants, nice shops and very interesting museums, such as the Goulandris Mouseum of Contemporary Art, which is considered as one of the most important in the Balkans. 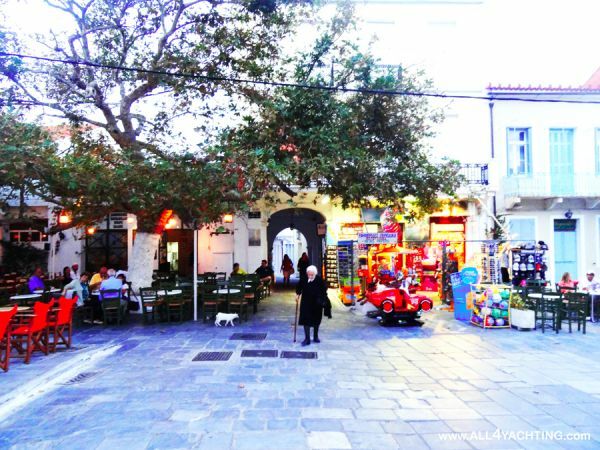 Having a coffee or a “meze” (snack) in the cozy cafes of Kairi Square -the locals’ meeting point- is also must. 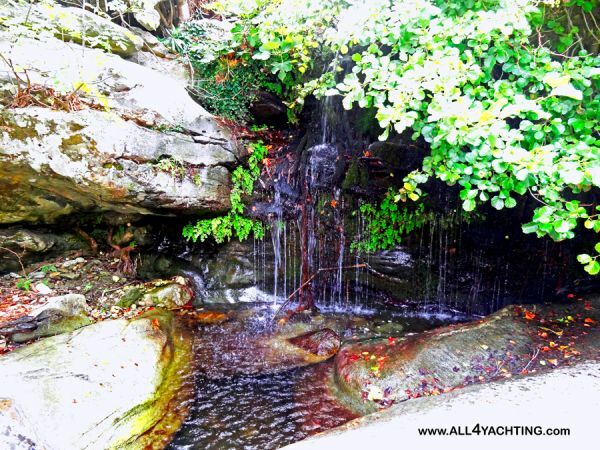 There you will admire some nice monuments, such as the marble fountain, and sea views. You can also visit the interesting Archaeological Museum, with important exhibits dating from 8th century B.C. 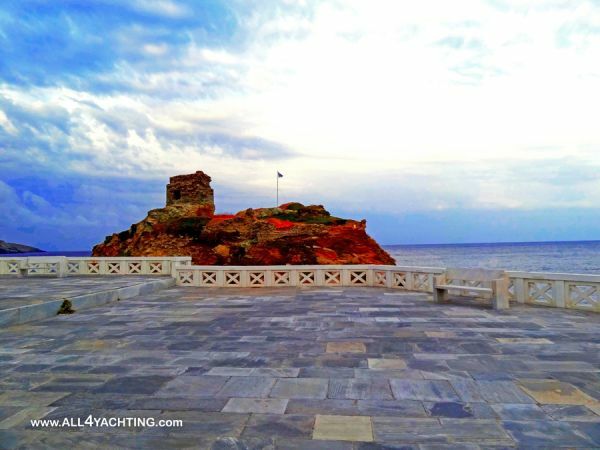 Do not forget to pass the arch and proceed until the end of the peninsula, to the impressive square where the big statue of “Afanis Naftis” (the Lost Sailor) lies. 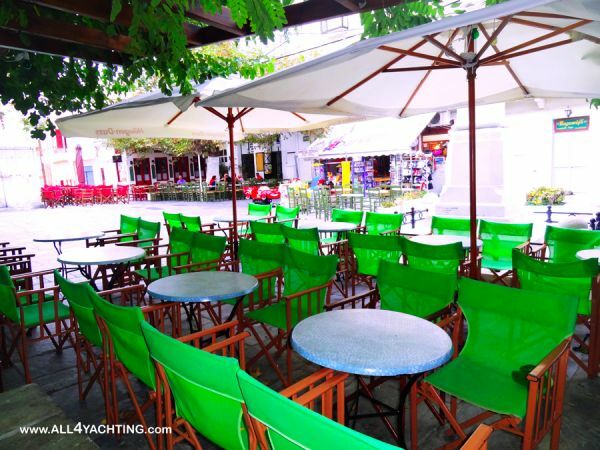 The blue sea of the Aegean embraces this marvelous square, giving the sense you are walking on a ship’s deck! 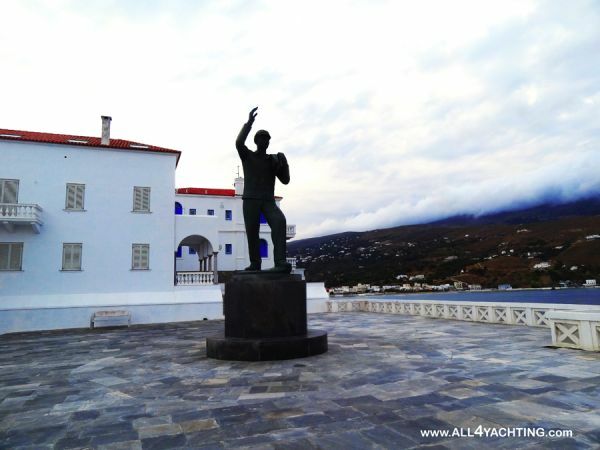 It is worth to pay a visit to the Naval Museum found there, which reflects the rich naval tradition of Andros. 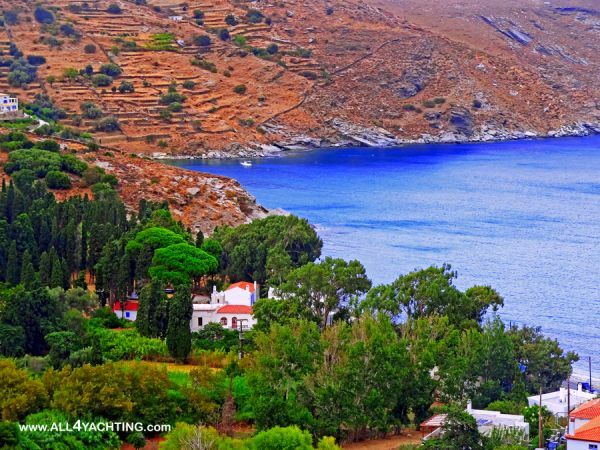 Andros mainland has beautiful traditional villages, worth visiting. 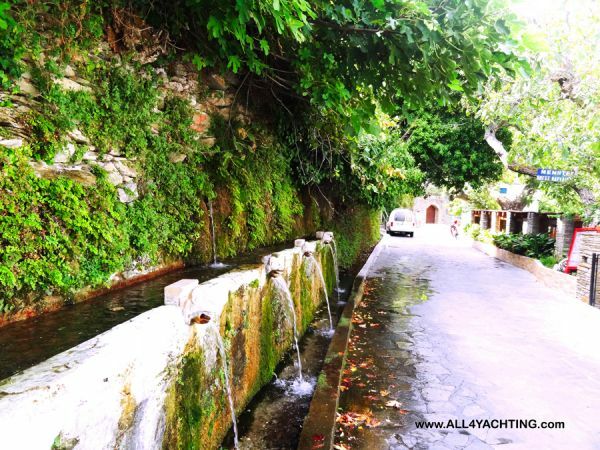 One of the most charming is Menites, which is full of waters coming from the fountains in its entrance, lush vegetation and few houses. 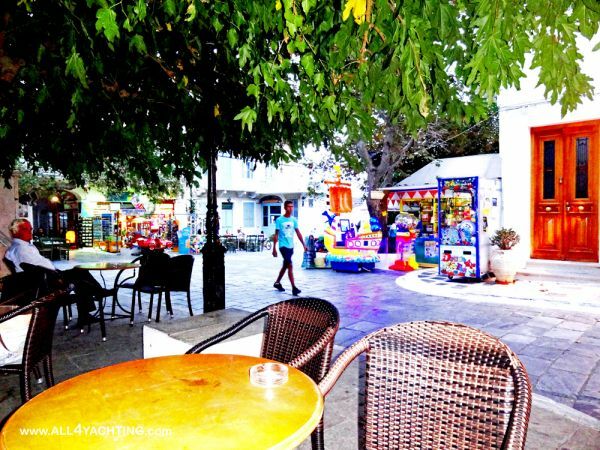 There you can have a meal or a drink in the local taverna. 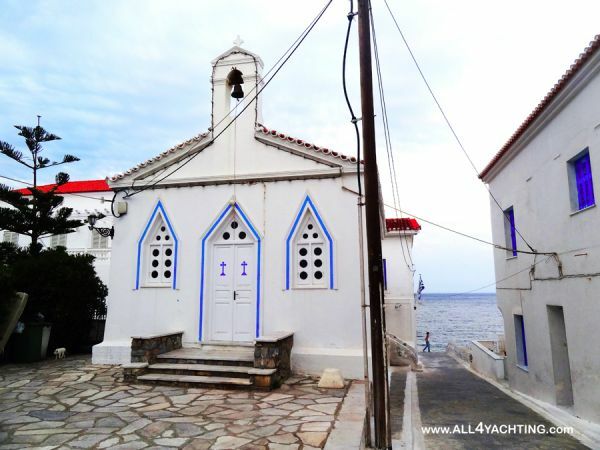 Stenies is another beautiful village with impressive traditional red tiled houses built some decades ago by the wealthy island’s captains. 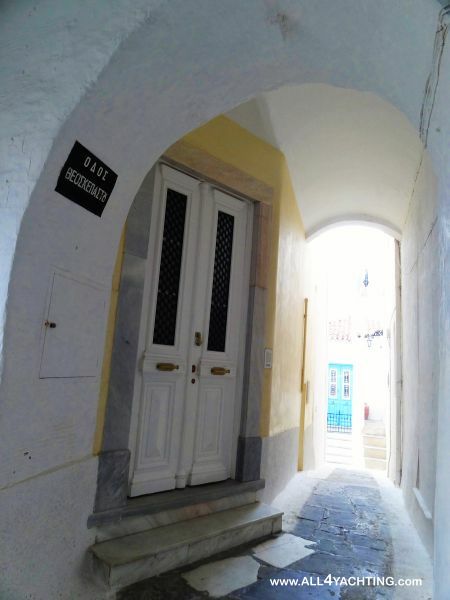 Vehicles are not allowed in it but you park your car in the parking and walk in its stone paved streets. However the village is strictly residential without any shops or cafes. 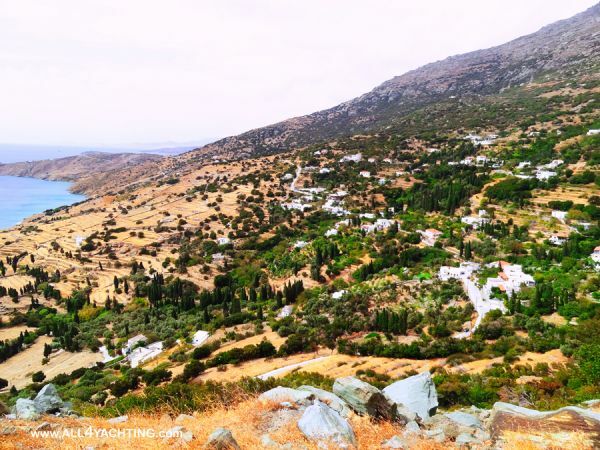 Apikia, already mentioned previously, is another beautiful village facing the sea, with thermal springs and the famous Sariza water-bottling plant. 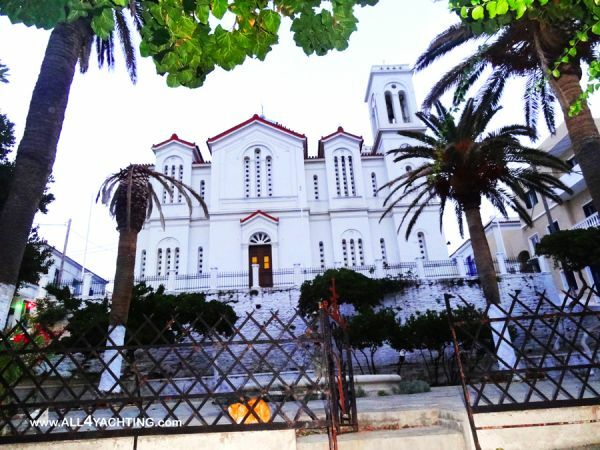 Andros has important museums and culture. The Vasilis & Eliza Goulandris Museum of Contemporary Art is one of the most important in the Balkans and is funded and operated by the institution of the so named wealthy shipowners’ family. Every summer it organizes different exhibitions of international prestige, such as those of Paul Klee, Miro, Matis, Kadinsky, Picasso etc. 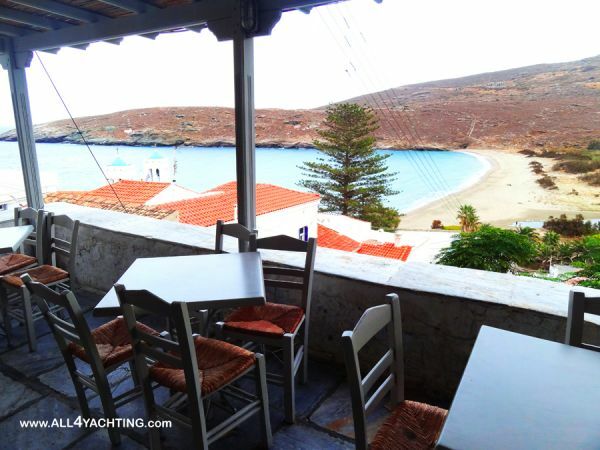 It is housed in a beautiful building in Hora and has a cozy café facing the sea. 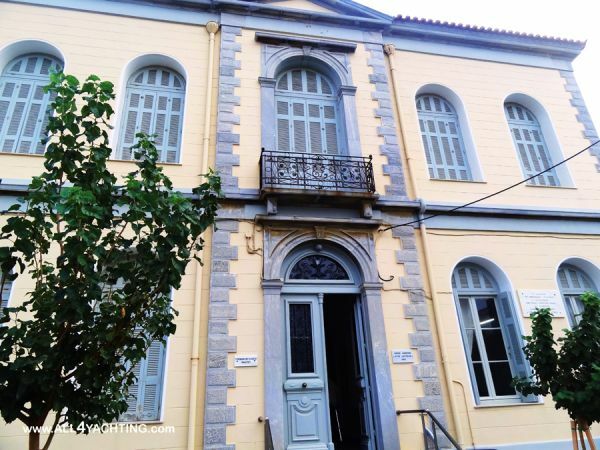 The ‘Kydonieos Institution” Museum of Contemporary Art, in Hora, funded by the so named family. 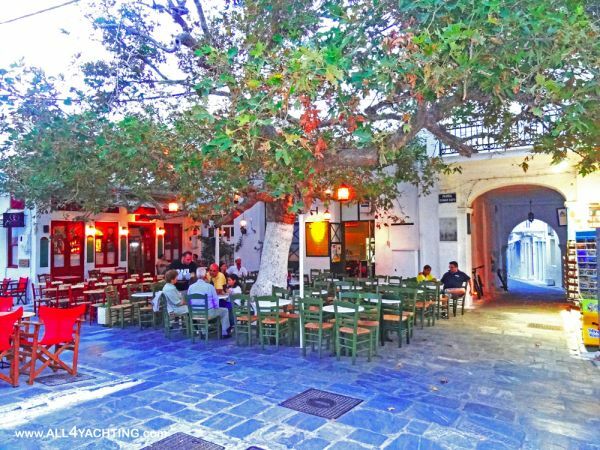 It organizes various cultural activities and has housed important Greek artists. The Folk and Christian Art Museum, in Hora’s entrance. The Archaeological Museums in Hora and in Paleopolis (already mentioned). The Museum of Cultural Herritage in Syneti. The Kairios Library, in Hora, which houses 60.000 books, historic archives and other pieces of art. The Olive Press private museum, in Pitrofos village, on the road from Hora to Gavrio port. You can visit it prior to an appointment only. Agadaki Tower, in Apatouria village (5 km from Hora). 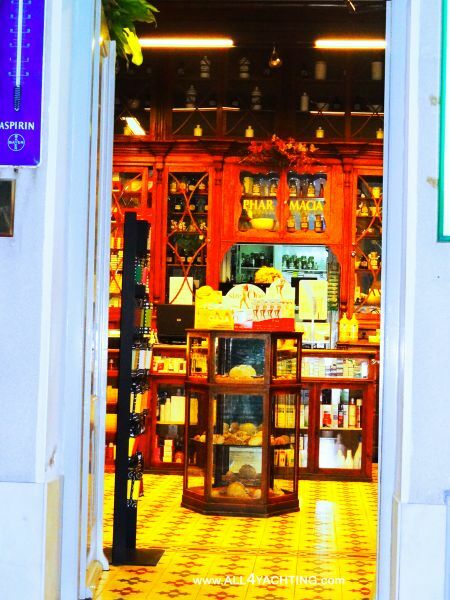 There you will have a chance to see an old olive press and traditional agricultural artifacts. Zagora is the most significant and the most organized on the island (10th -8th century B.C. ).